Many Tioga County Towns, Streams and Mountains Were Named for Pioneer Settlers, Famous Citizens, Indians, Characteristics of Section; Mazie Sears Bodine Presents Some Examples. Many of the towns, streams and mountains in Tioga county were named for pioneer settlers or in honor of a famous citizen in another part of our country. Some were given Indian names, while others were named for some characteristic of the place or for a special event happening nearby. The word “Tioga” is an Indian name, and has been spelled in many ways and given many definitions. The earliest written forms of the word are Diahoga, Diago, Tiaoga and Teoga. In a letter, dated October 13, 1756, it was spelled Tioga, but it was not until the time of the Revolution that it settled down to its present uniform orthography. Different authorities have given it the following interpretation – “How swift the current,” “Swift current,” “Sweet water” and “Head water.” But the one that seems to be the most authentic says that Tioga is an Iroquois word and means, “Gate – a place of entrance.” This name was given by the Six Nations to the wedge of land lying within the forks of the Tioga and North Branch of the Susquehanna, in passing which streams the traveler entered their territory, as through a gate. The Tioga River rises in a tamarack swamp in the Armenia Mountains in Bradford county. Here it is called Tamarack Creek, but after being joined by several other small streams and entering Tioga county is known as the Tioga River. From its source to its mouth, near Athens (first called Tioga Point), it flows in a large curve. Its entire length being about 80 miles, while the source and the mouth are only about 35 miles apart. It bore the name, Tioga, all the way around in Indian times, and it never should have been changed to Chemung in New York. The name is now perpetuated by a county, a township, a borough and the river in Pennsylvania, and also by a county in New York. The Cowanesque River was named by the Seneca Indians. The word was Ka-hwe-nes ka, meaning “at or on the long island.” All Indian names were significant and chronicled some characteristic of the thing named. In this case there was originally an island in the Cowanesque river containing over 1600 acres. It was over four miles long and of varying width. The early settlers dammed the part of the river which ran on the north side of the island, diverting the water into the channel on the south side. So completely has the island been destroyed that one would be unaware of its existence, unless informed of the fact. To the Indians it was an important landmark and the most outstanding characteristic of the river. The island is given on all early surveys and it also appears on the Connecticut map. It was situated near the present town of Osceola. Some authorities tell us that in the early days Pine Creek (the River of the Pines) was called the Tiadaghton. Others say “Tiadaghton was the name of an Indian chief, whose village was situated near the junction of Pine and Babbs’ Creeks. An that the town of Tiadaghton, in the Pine Creek gorge, was named in honor of this Indian. History says, and many citizens agree, that Pine Creek, from the great water shed it drains, should be called a river. I wish it might have kept the name – Tiadaghton River. It has a fall of 20 feet per mile for fourteen miles, and is, therefore, a swift current. Many of the small streams in this county are called “Runs.” Probably because they are swift mountain brooks that seem to run down the hillsides. In nearly all these streams one will find beautiful falls tumbling over rocky ledges. Some times the creek beds are nearly filled with large moss-covered boulders around which the water gurgles in its endless flow down the mountain side. Many varieties of ferns and wild flowers, also dwarf and trailing evergreens, tea berries, wintergreens and other wildings grow along their banks. Slower flowing streams are called brooks, creeks, forks or branches. All have interesting names, and with some, one can really imagine why they were so called, as: Four Mile Run, Mill Creek and Mill Run, Basswood Run, Long Run, Red House Hollow Creek, and many others. Some were named in honor of an early settler in that particular locality – Heise Run, Kennedy Run, Cummings Creek, Nate Mead’s Book, Kelsey Creek, Mitchell Creek, Babbs’ Creek, Hill’s Creek and Lamb’s Creek. Elk were numerous in Tioga county in pioneer times. So we have an Elk township, at least three Elk runs, one stream called the Elkhorn, a small village named Elk Run, and the borough of Elkland. One of the older residents of Wellsboro says that many years ago herds of elk came into the county each spring and fed upon a moss growing in upper Pine Creek. In the fall they went farther south for the winter. This moss grew under the water. Dry weather and other adverse conditions have killed it, so at the present it is not found in abundance. The elk have entirely disappeared. Horse Thief Run was given this name because, in the very early days, when the region near this stream was a rough wilderness, a band of horse thieves had a rendezvous here. The stolen horses were kept here until such a time as they could be safely taken out of the country and sold. One driving down the Stony Fork valley can easily see how the stream came by this name. The creek bed is filled with stones of all sizes. There are also many large boulders and rocky ledges. While several falls and deep pools add to the beauty of the stream. In pioneer times it was known as “The Rock Branch of Babbs Creek.” Later it was called “Stoney Creek” and then Stony Fork Creek. (Notice the difference in the spelling). The village of Stony Fork took its name from the stream. The early settlers called the panther, a “painter.” Hence the name of Painter Run given to at least two stream and one small village. Mt. Tom, the large mountain at Ansonia, was named in honor of Tom Stowell, a surveyor and son of Hezekiah Stowell. Tom Stowell did a great deal of surveying in this vicinity. His father moved to Pine Creek, now Ansonia, in 1835, and was associated with Peter Dicerson in the lumber business. Later their land and property came into the hands of Phelps Dodge, and Company. Ansonia was named for Anson G. Phelps, head of the firm. The first explorers coming up Pine Creek, found at this place a large tract of cleared land supposed to have been cultivated by the Indians. They gave it the name “Big Meadows,” by which it was known for some time. After the saw mills were erected it was called Manchester Mills, or simply Manchester. Later it was given the name of Ansonia, which it still retains. (Continued next week). The queer shaped hill near the Marsh Creek station, between Kennedy and Straight Runs, has been names Mt. Nessmuk, in honor of George W. Sears, noted woodsman and author, whose penn name was Nessmuk. It was the name of a young Indian who, Mr. Sears says, “was won’t to steal me away from home before I was five years old, and carry me around Nepmug and Junkamaug lakes, day after day until I imbibed much of his woodcraft and all his love for forest life.” This was in the state of Massachusetts where George W. Sears was born. The word Nessmuk means, in the Narragansett tongue – ‘Wood-drake.’ The sign designating Mt. Nessmuk was destroyed when, in an accident, an automobile knocked it over. But a new one has been ordered by the Highway Department and we hope will soon be erected there. Among the mountains on the east side of Pine Creek, not far below Harrison Park, is one called Cobble Hill. From a high point on the L. B. Taylor farm one can readily see why the early inhabitants gave it this name. This hill sets out from the ones behind it, and looks like an inverted bowl or a large cobble stone. Did Mother Nature drop one here and old Father Time cover it with dirt and plant trees and shrubs on the place? If you wish to see Cobble Hill from this vantage-ground, and also see a magnificent view, stop sometime at the L. B. Taylor place on Route 660, between Wellsboro and Harrison Park. Ask where this high point is located, also if you may go up across their fields to the spot. I will not try to describe the view, only to say that one can see of many miles in a complete circle around this point. Before the days of delivery there were many small post offices in the county. No two in the state could have the same name. Sometimes the citizens of a community sent several lists of names to the Post Office Department before one was suggested that could be used. This is what happened when a post office was established at Sweetbrier. There is a small hamlet south-east of Sabinsville by the name of Azelta. This place was first known as Greenville, but as there was another Greenville in the state, this name could not be used for the post office. Marvin Abel suggested the name Azelta, just why or what meaning the word has, the oldest present inhabitant does not know. When asked why it was called Greenville, he said that one Seymour Giles came into the region many years ago and built several houses. These he painted with Paris green and buttermilk! Most of the houses being green, the place was called Greenville. Osceola was first known as “Pindarville,” due to the fact that Robert H. Tubbs of this place contributed poems to the Lawrence Sentinel (a paper published in Lawrenceville) dating them from “Pindarville.” When an application for the establishment of a post office was made the name Pindarville, Bridgeport and Osceola were suggested. A public meeting decided in favor of Osceola in honor of a once famous Seminole chief. The first brick house erected in Tioga county was built at Osceola in 1829. Stephen Potter, from Rhode Island, was the master mason. Round Top took its name from the shape of the roof of the first school house. This roof was not exactly round, but compared with the roofs of other buildings seemed round. It was called the Round Top school, then the village began to be called Round Top. Later when a new school house was built, this old one was sold to one of the residents. He used it for a barn, and this is why some say Round Top was so named from the shape of a barn roof.. The Summit was so called because it is the highest point on the railroad grade between Wellsboro and Antrim. When a post office was to be established it was given the name of Brownlee, in honor of Robert Brownlee, superintendent of the Antrim Sand Company, once located here. The sand was manufactured for glass making and for use on locomotive engines, from sand rock. The station was the Summit, the post office, Brownlee. Duncan township was named for Duncan S. Magee and Antrim in honor of the County Antrim, Ireland, the home of the Magees. They came to America in 1784. The Magees were leading spirits in the development of the great coal deposits of Tioga county. On the public square in Wellsboro is a monument erected in honor of John Magee. The money for this monument was contributed by the employees of the Fall Brook Coal Company and it was unveiled December 1, 1886. The first settlers in Delmar township came from Philadelpha, and from Virginia, Delaware and Maryland. The township in which they located , out of compliment to these states was given the name Virdelmar. But today the syllable Vir was omitted and the township incorporated under the name of Delmar. The village of Lamb’s Creek and stream by that name were so called in honor of Gad Lamb, the first permanent settler along the Tioga River, in this vicinity, coming here as early as 1797. In the year 1804 Asa Mann came to the Tioga River valley and settled near the present site of Mansfield. About the year 1824 he purchased 200 acres of land and where the town stands today, cleared a large field of some 20 or 30 acres. This field, which had no house, was known far and wide as Mann’s field. The reader will be quick to discover the origin of the name – Mansfield. When the Williamson road was being built through the wilderness of Tioga county, it was the custom to establish depots for the storage of supplies. Also to erect a commodious log house to shelter the women and children, and then advance with the axmen, roadmakers, etc. and prepare the way. The “Block House” was established at what is now known as Liberty. The house was constructed of logs and about 20X40 feet in size. This Block House stood in the midst of a heavy forest of timber and it remained there for years as a famous historic landmark. Peter’s Camp was the next place where a depot was established. This was at the present sight of Blossburg. At Canoe Camp, eight miles down the river, the work of road building was temporarily abandoned, on account of the lateness of the season, and the party floated down stream in canoes which they had hurriedly constructed. Canoe Camp is the only one of these three places which still retains the old name. Cherry Flats received its name because, when the first settler, Timothy Culver, came into that vicinity he found the flats there covered with a very luxuriant growth of wild cherry trees. Jackson township was named in honor of Andrew Jackson, the hero of the battle of New Orleans, and later president of the United States, Garret Miller was the pioneer settler of the township and Millerton was named in his honor. Trowbridge, near the center of the township, was named for Henry Trowbridge, the first settler, and is said to enjoy the distinction of being the only post office of that name in the United States. Among the early settlers of Sullivan township were a number of Revolutionary soldiers, who had seen service under General John Sullivan. When the township was organized, these early settlers named it “Sullivan,” in honor of their commander. Clymer township was named for William B. Clymer, a grandson of George Clymer, a distinguished Pennsylvania and one of the signers of the Declaration of Independence. Mr. Clymer did much to encourage the settlers. Many stories are told of his generosity and helpfulness, loaning them money, refusing interest therefore, doing his best to aid them to make permanent homes in this township. Sabinsville is the largest village in Clymer township and was named for Alonzo G. Sabin, who settled here in 1838. James Mix, who located at what is still known as Mixtown, is reputed to have been the first settler in the township, coming here as early as 1818. Gaines township was named in honor of General Gaines, who was conspicuous in the removal of the Creek Indians during the administration of John Quincy Adams and Andrew Jackson. There are many more places, streams and mountain in Tioga county with interesting names. Some, the origin of which, history does not divulge and I have not yet discovered. While there are others I will not take the space now to tell about. So perhaps at some future date there may be another article on this same subject. In my article about the names of streams, mountains and towns in Tioga County, I promised the readers of the Gazette that sometime there would be another one on this same subject. So many names have very interesting origins, while the stories told are fascinating and should be preserved for future generations. “A chest weighing 200 pounds went out last night.” etc. etc. So the whites came to believe the Indians did know where to find gold or silver in Bloody Run Hollow. But no one ever discovered any, or ever knew what it really was the Indians brought out from this place. Charleston township, near the center of the county, is interesting because the general surface is considerably elevated. Forming a watershed between the Tioga River on the east, March Creek and Pine Creek on the west, Babb’s Creek on the south and Crooked Creek on the north. Many of the tributaries of these streams have their headwaters in this township. Whitneyville, in Charleston township was named in honor of Alonzo Whitney. He was not one of the first settlers there, but came from Gibson, N.Y., about the year 1849. He and his son, Captain Nelson Whitney, purchased lands in and surrounding the village and were engaged in lumbering, merchandising, and farming. Later they built a carding machine and a saw mill, and also had a large interest in a cheese factory. Dartt Settlement was so called in honor of Col. Justus Dartt, a soldier of the Revolution and colonel in the Vermont militia after the Revolution, who settled there in 1811. He was, at one time, a county commissioner, and also one of the trustees of the old Wellsboro Academy. Peter Shumway, also a Revolutionary soldier, was one of the first settlers on the hill that bears his name, coming to Tioga County as early as 1805. Wetmore Hill was named for the Wetmores who settled there. The Catlins gave their name to Catlin Hollow Run and the village of Catlin Hollow. They are listed among the tax payers of 1821. Welsh Settlement was so called because most of the early settlers there came from Wales or were of Welsh descent. While Swede Hill was given its name for the same reason. At the present time one will find a lovely woodland drive from the Summit, past the Water Company’s pump house, up Swede Hill, and when reaching the top, if you keep to the left you will be rewarded by a beautiful view of the county side; although the road goes down a steep hill and is rough and narrow for a short distance. Before Route 84 was hard-surfaced and the curves straightened, there was a very sharp one about two miles south of Morris. This curve was known as Love’s Elbow, taking its name from an early settler whose home was nearby. The name, Eli Love, is given as one of the original members of the First Baptist Church of Morris when it was organized, Aug. 23, 1870. From Oregon Hill down to the Dixie Run road is a very narrow ravine called Love Hollow. I was told a family by that name once lived in the Hollow. Also that during the lumbering era a small saw mill was situated there. While it is another beautiful drive down Love Hollow, we could find no trace of the mill nor any houses that might have been there so many years ago. Nauvoo, situated in Liberty township, lies on both sides of Zimmerman’s Creek, “Texas creek it is now called” and is partly in Morris township. It was named by Mrs. Lydia Jane Pierson because during the Mormon excitement a few persons living in the neighborhood became adherents of that faith and went with the Mormons to Nauvoo, Illinois. She and her husband, Oliver Pierson, were pioneer settlers, coming into the township as early as 1822. Mr. Pierson having invested in 1000 acres of wild land lying in and around the village. Mr. Pierson and his sons cut a road through the forest from Block House to their holdings, a distance of about five miles. Mrs. Lydia Jane Pierson attained great distinction as a poetess and for years ranked with the best female poets in America. She wrote for “The Pioneer,” the first newspaper published in Tioga County, which made its appearance in Wellsboro in 1825. She also was a contributor to the Lycoming Gazette, published in Williamsport. One of her most pathetic poems, not usually found in her published collection is on the departure from her forest home in Tioga county. It is called “The Long Farewell” and is printed in the History of Tioga County. Now let us return to Wellsboro and go out on the hill road now Route 362 toward Ansonia. If we had been driving out this way many years ago, we would have found a guide board at the second four corner. This was probably the first four corners in those early days. I have been told it was the first and for a long time the only guide board in all the country about. So this place was called “The Guide Board.” On this corner stood a Road House and here travelers stopped to feed and water their tired horses, rest a while themselves and visit with other wayfarers. I have often heard older people speak of the place as The Guide Board. “So and so lives over near the Guide Board.” “I have been over to the Guide Board.” etc. Probably some of the older citizens still call it by that name, though both the Road House and old guide board have been gone for many years. A post office called Spicewood was established here before the days of rural delivery. It was so called because many spicewood shrubs were growing in the vicinity. During the winter of 1902-03, two young ladies of Dexter wrote news items about this place for the Wellsboro Agitator, dated from Biscuitville. For some time many people wondered about the location of Biscuitville. On Dec. 19, 1902 the following appeared among these items. “There has been much talk of putting a trolley line through this place. The residents are in hopes this is not all talk, but that in a short time Thumptown, Biscuitville, Spicewood and other neighboring places will be connected by trolley. The small village of Balsam was given this name because of the balsam swamp nearby. I think Asaph Run and the village o Asaph may have been named in honor of Asaph Ellis, one of the first settlers in Shippen township though I could find nothing in the history to corroborate this opinion. In an old magazine of the year 1860, this stream is referred to as Asof Run. About the year 1848 Solomon Bennet, grandfather of S.V. Bennet of Orlando, Fla., formerly of Wellsboro and Middlebury, came to Tioga county from Elmira, N.Y. He and John M. Randall of Veteran, Chemung County, N.Y., determined to erect a saw mill at the head of Nate Mead’s Brook in Chatham township, and for this purpose commenced cutting away the timber and making a road up Norris Brook. They erected a shanty on flattened timbers, sufficient to accommodate their workmen for dining and sleeping purposes, and stated the work. As they progressed, two or three teams were hitched to the shanty and it was drawn up as far as the road was completed. In this manner they reached the head of Nate Mead’s Brook, erected the mill and began cutting the pine timber. This road up Norris Brook is still called the “Bennet Road.” Later a mill owned by Bennet and Dimon, standing on the same site, cut the hemlock which was let when the pine was cut 20 years before. Solomon Bennet also built a saw mill, grist mill, store and houses for the workmen on the Bennet road, about one-half mile above the corners known as Niles Valley. This business grew and flourished amazingly and the village was called Bennetville. The lumber from the mill was carted by teams to Tioga where it met the Erie Railroad, which shipped it to the Bennet lumber yards in Brooklyn, N.Y., and Newark, N.J.
Great tales are told of the pine boards 30 inches wide, without a blemish, the products of these virgin forests. The home in Bennetville where parents of S.V. Bennet lived when they first began keeping house is still standing, shaded by a large pine tree which, when a small seedling, was planted by the grandfather. This tree is about 85 years old and over three feet through at the base of the trunk. Later the family moved to the place at Niles Valley now occupied by Mrs. Olive Ferry. The house was remodeled and enlarged. Here S.V. Bennet was born and spent his childhood days. The large evergreens in the yard were planted by his grandfather nearly 80 years ago. The fence still enclosing the yard was built in the spring of 1864; 79 years ago next spring. Work in the carpenter department of the mill being slack, a Mr. Pope was directed to work out timber for this fence which has always been noted for its unique design. When I was a young girl, my aunt, Mrs. Ellen Sears Stowell lived in this same house. My cousins and I played under the evergreen trees and walked up the Bennet Road to the Bennet store to purchase groceries. Isaac Bush, grandfather, of Mrs. Kittie Rose Bailey was an assistant in the machinery department of the Bennet mills and was killed there while adjusting some of the works. I am indebted to S.V. Bennet for most of these interesting facts about a village which long ago ceased to exist. He also told me that one evening in those early times, his father was riding home from Chatham, on his favorite mount. Coming down the Bennet road the mare suddenly started on a run which he could in no way control. He then hears some animal following them in the tree tops, leaping from limb to limb. He gave rein to the horse and landed in the first clearing, now the farm of Wesley Root. A terrible cry as of a woman in distress filled the air and he then knew he had escaped being torn to pieces by a panther. Middlebury Center, a short distance below Niles Valley was known for many years as “Potter’s” The place took this name from Henry H. Potter, who came in 1843 and who for over 30 years kept a hotel on the west side of the toll road. His sons also kept this hotel and it was not closed until 1892. After this it was used as a family residence, and then stood deserted for a few years when it was torn down. Before the coming of Mr. Potter there was a log tavern on this same site. When a post office was established at Middlebury Center. Mr. Potter was the first postmaster, keeping this office for several years. Benjamin Wistar Morris, the first settler upon the site of Wellsboro, came from Philadelphia about 1799, as the representative and trustee of the Pine Creek Land Co., and also as the contractor for opening a north and south road from Newberry to the New York state line. This road was to be built by subscription, but after it was laid out and opened, the state was to pay $3000 to reimburse the subscribers. On July 26, 1799, Morris took the contract for making the new road. William Ellis was appointed viewer and on Christmas Day 1802 Ellis reported that in his opinion the said Benjamin W. Morris had faithfully complied in substance with his contract and the road was completed. The part of the north and south State road that is the most interesting to us, is its course through the valley where Wellsboro is now located. While is was all a wilderness here at that time, we will follow the road in terms of today. It entered Wellsboro on Pearly street, and just above the Catholic church dropped down the bank and crossed the stream. In those early days there were no bridges, one forded the streams. But later a bridge was built at this crossing. The last one was washed away in the flood of 1919 and has never been rebuilt. Here the old road followed down the stream and crossed it again at the head of Main street, then kept straight down the valley until it reached the junction of Main and Waln streets, where it turned to the left. It crossed the creek again on what is now Brewery Lane, turned to the right near Hastings street, crossed Queen and went out near Sherwood street. It followed ridge and dropped down the bank near the Swanson place on Tioga street. Here it went over the flat and crossed the stream near the first railroad bridge, coming back across below the second railroad bridge. When we consider the fact that part of the present site of Main and Tioga streets was at that time marshy ground, we find a motive for the viewers of the old road to choose the ridge above. But imagination fails to supply any reason for dropping into the deep narrow hollow where the railroad bridges are located, and so being compelled to cross the stream twice. Keeping along the ridge they would have avoided both these crossings. We are told that the first burying ground of the early settlers in Wellsboro was located on the slope above this old road, near the junction of Brewery Lane and Hastings street. Also that when the water company put their line up Brewery Lane, a human skull and a thighbone were recovered. 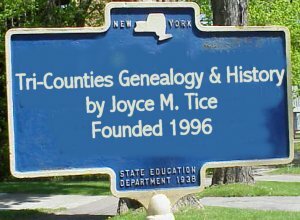 So, as we make inquiries of our friends, or read the old histories and articles written long ago, we find many interesting stories of Tioga county.